To achieve sustainable peace and reduce the growing need for humanitarian aid ($25B so far in 2018), governments and humanitarian organizations need to better address the drivers, parties, and consequences of conflict. 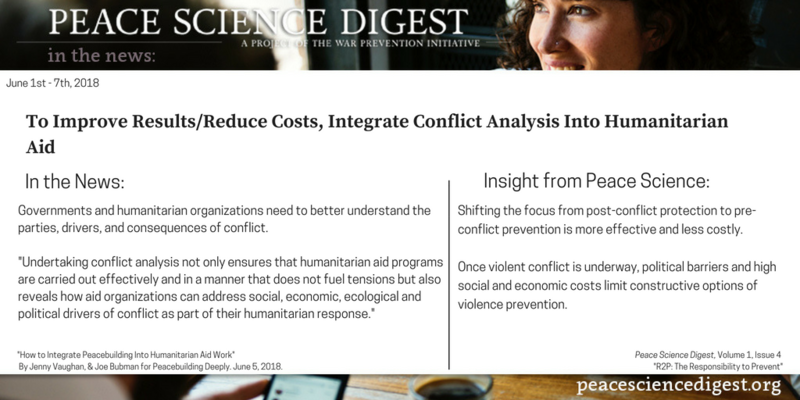 Shifting the focus from post-conflict protection to pre-conflict prevention is more effective and less costly. “How to Integrate Peacebuilding Into Humanitarian Aid Work”. By Jenny Vaughan, & Joe Bubman for Peacebuilding Deeply. June 5, 2018.